There are some fundamental plan elements working well for many businesses at the moment. 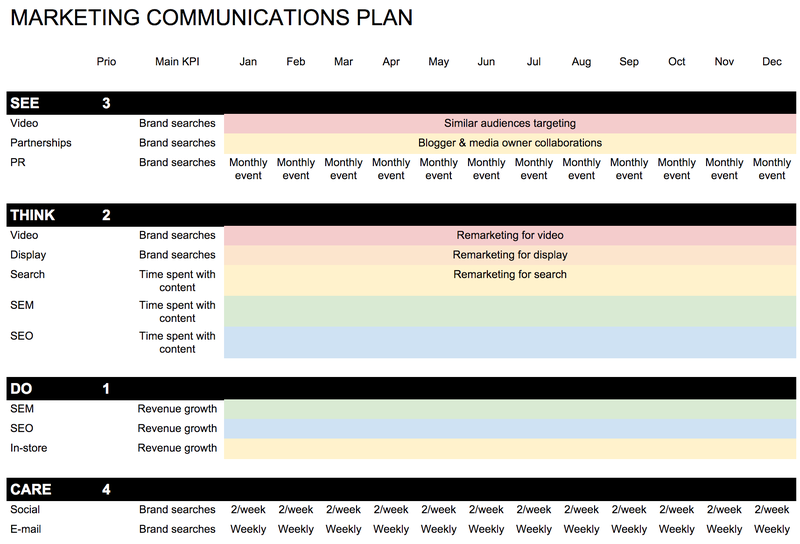 In this post I’ve collected some fundamental thinking around what the starting point for a media plan in 2016 can look like for any business, big or small, across industries. Take a starting point in this media plan and make justified changes for your business. Here is the plan, I’ll go through it in detail below. DO – The most receptive people who are ready to buy here and now. If someone knocks on the door to your store to buy, you open the store before you do anything else. THINK – Think of this as a teenager coming to you asking for advice vs sitting in their room with their headphones on – that’s how important receptivity to communication is. The THINK group is the only group besides DO that have signaled that they are interested in your industry, so it’s a natural priority after DO. SEE – This requires a bit more explanation. The two groups SEE and CARE have not sent any signals showing that they have any interest in your industry right now. CARE had so once, because otherwise they wouldn’t be your customers. That said, Prof Byron Sharp shows in his book that customers who bought a lot from you are less likely to do so in the future, and vice versa for other customers. In fact, opposite to the traditional saying it’s actually cheaper to get a new customer than to keep an existing customer. CARE – People who bought from you once. You should be able to reach most of them via owned media. Now looking at the media choices in each bucket. When people are ready to buy, nothing beats search marketing (SEM) and in-store promotions. Both are valid if you sell online, offline or both. For your online sales the in-store marketing is of course for your online store. For your offline sales people still research online by searching for answers, making SEM & SEO a priority also for offline retailers. Search Engine Marketing (SEM) – An easy way to reach a lot of people who are ready to buy. Ensure you either have someone very experienced in SEM in-house or a great SEM agency to do this work. Search Engine Optimization (SEO) – This is important to make it easy for search engines to navigate your website and therefore increase the chances that people will find you. In-store – This could be a lot of different things. It’s important to experiment here and really see what works. Both in physical stores and online stores there are already a lot of learnings in the area of shopper psychology that you can take a starting point off when continuing to test-and-learn what works. At THINK stage you want to communicate with people who have started to take an interest in your industry. They often research a future purchase. These people are very valuable, and you want to test and learn what execution of what media makes them search for you and spend time with you. You often find these people from a technical point-of-view in remarketing lists that you have gathered from people visiting your website and engaging with other industry assets. Remarketing therefore becomes one of two important blocks at this stage. The other block is search, and a search engine’s biggest asset is intent data, i.e. they know not only what information people want, but exactly when they want it. SEM – SEM at THINK stage differs from SEM at DO stage since the KPI is different. At DO stage you optimize for your most important financial KPI, for example revenue growth. At THINK stage you optimize for people spending time with your brand to drive mental availability. In many cases SEM agencies struggles with moving away from DO KPIs such as Cost Per Acquisition (CPA), so you need to be very clear about that this is a different SEM plan. SEO – Make your content, not only your online store, discoverable. So even within the THINK segment you can segment further based on intent (intensity of commercial intent). We bundle SEE & CARE since in both these stages people are not signaling any commercial intent. If they did they would be in the THINK or DO bucket independent of if they bought from us before or not. It’s very important to realize that just because someone bought from you before (CARE) it doesn’t mean that they will buy from you again. In fact, Byron Sharp shows that the likelihood is rather the opposite. The only difference between your communication towards the SEE and CARE buckets is that the CARE bucket you should be able to reach via “free” media such as e-mails. If someone bought from your before you have hopefully had the opt-in to messages from you, enabling you to reach them with little to no cost. One thing that few advertisers do is to then deduct the CARE people from the SEE people to save money. If you for example have had 10% of a population buy from you once, you should be able to save 10% of your media budget at SEE stage just by adding people that bought from you already to a so called “negative remarketing list” and thereby not pay for advertising towards them. Imagine if 40% of people bought from you once how much money you could save. This is something that you can turn into a competitive advantage, since the money you save can be used to reach more people that didn’t buy from you yet. Similar audiences – The by far most effective targeting at SEE stage. Here you target people who have had the same behavior as people that ended up buying from you. They have visited the same sites, liked the same pages etc. This is a very powerful way of extrapolating your great data into the unknown. So we recommend that for digital media (video, social) you use similar audiences as targeting. Video – Online video is one of the fastest growing medias today and it accounts for 50% of all mobile traffic. It also has an average click-through rate of 1.84% which is higher than any other media (Link). People are also 39% more likely to share video content than other content (Link). Use similar audiences as targeting and design video content as explained in the content chapter. Video can be delivered via many different platforms, just ensure you compare Reach, Impact (viewability, experience etc) and Cost between your options. Partnerships – You can benefit from partnering with various players that have great reach to offer. For example if you sell children’s products you might want to partner with parenting bloggers. The benefits of this can be within either Reach, Impact or Cost. For example, the blogger might Reach people you wouldn’t reach otherwise, they might be able to present your assets in a more Impactful way than you would otherwise, or when you add up all the costs for the blogger outreach, the Cost might be more beneficial than alternatives. PR – With PR we mean media outreaches. At the end of the day it’s about helping to bring news to the market. It might be a study you’ve made that discover insights that would make people’s life a bit better, or that you’ve created amazing content that different media would want to share. Sometimes it’s easier for a smaller entrepreneur (underdog) to get people to listen to them via media outreaches, while for bigger players the response might be “buy an ad”. Customer support – In the CARE stage it can play a role as a customer support function to have customer support answer people’s questions. Video/display distribution – If you want to distribute for example videos at SEE stage using social media it’s just another video advertising channel where you need to compare Reach, Impact and Cost, where as always Impact will be the most tricky thing to compare, so ensure you spend time on that. If you have a social channel with many followers you can post videos, images and texts to reach them. That said, it’s important that you check what the strategy is of the social platform you are using. In some cases you cannot reach your followers organically by posting something, because the media owner wants you to buy advertising instead. So, take a starting point in this media plan and make justified changes for your business. Have fun and please feedback any improvement suggestions to this base template.